Never said I wasn't busted, my friend. I admit it made me chuckle though, hehehe. I did have a good chuckle too dude, thats why i love it here. My wife wonders why i laugh out loud sometimes and then when i try to explain she gives me that blank look as to say " what are you on tonight"? I've been on the boards for so many years now, that my wife just accepts it. The boards are... I dunno, a part of my life !!! I am sure somebody is out there thinking 'well then, you need to GET a life'... hehehe believe me, I have a life and then some but this place always has it's place and kinda keeps me going. I have had more laughs here than anything else. I confuse myslelf with my needs list. ANd in th buy sell trade none valiant section ~ I have a half list. That I print out, and ignore, then get annoyed that I have multipules of the same issue. I need to make a master list, so I can adjust and add to like suggested ~ and access others aswell so I can hunt and find quick, as gifts. So as the tittle has been taken already, we need. A master of all master list, with one post per members, or banned thread. And as for busting Kinights balls, do it aalready he has 6 kids and they are starving me of oxygen. Dont get me wrong, my wife fully supports and accepts its as a big part of my life, its just the stuff i laugh at really isnt that funny for anyone who wasnt there if you know what i mean. A master of all master list, with one post per members, or banned thread. That was my initial intent but hell, I even broke the rules first time out of the gate. I will end up clearing this thread, placing all the 'extra' posts in another thread so that members do not get docked by losing posts and making one thread, one post per member with their master needs list that is to be 'edited'. I was in a way comparing what I needed to what I now need but it fell apart. I will fix it. I am not ashammed to say that the boards are part of my life. I spoke to you, I speak to you more than my sister? Well maybe not, actually yes. I speak to my sister more butI email, pm, post on threads to you, Draco and Drift more than any other person I know. I hardly get yahoo emails, anymore as I have negletted my Australian friends over the last two year of being in DU. But when I go back on holiday it doesn't make a differance. I get really excited, when I get a PM. Or someone respondes to me in a thread. Looking after two kids, its interaction I need. I maybe check three times a day, morning lunch after dinner. Now it is 0430, I cannot sleep, so I come here to hang out. Nothing cooler than you guys and pms. Also Knightt i thought as you have done on your master list at the top i we add the date it was last updated in bold that way people can see if they were looking to help out what we have added or taken away. I will move my list here, but unfortunatly I cannot help many people as I don't have many spare du. But any du I do are free to you guys. Yeah, I like it.... will have to put that on a t-shirt one of these days. Oooooooooooooooooh now there is an idea. Ill pm you about this later my man. Yeah, this could be cool. The very RARE Mule vs. Chasm Tin is here! The raised 3D effect on this cover lid is kool! I never thought i'd see one of these tins in my bare hands! 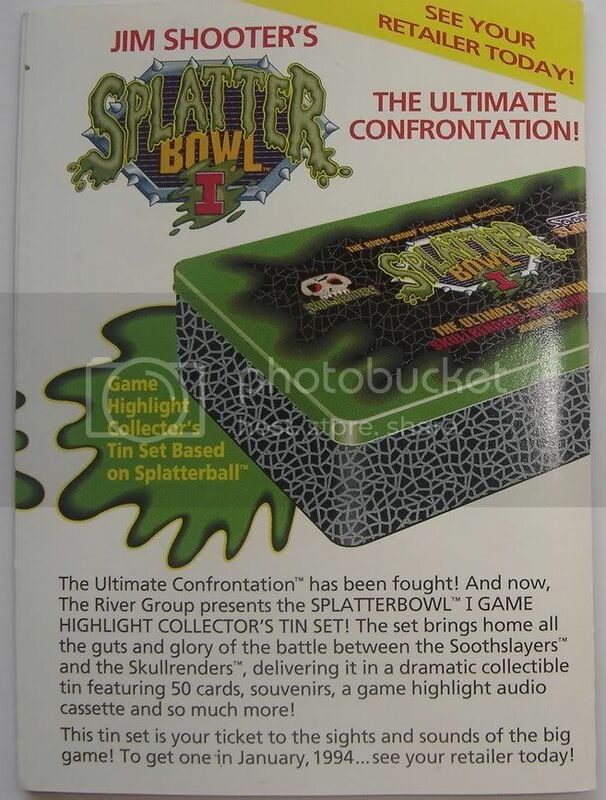 Concerning the Splatterbowl tin... someone told me that there were two different Splatterbowl tins ? (i.e. different cover art ?) 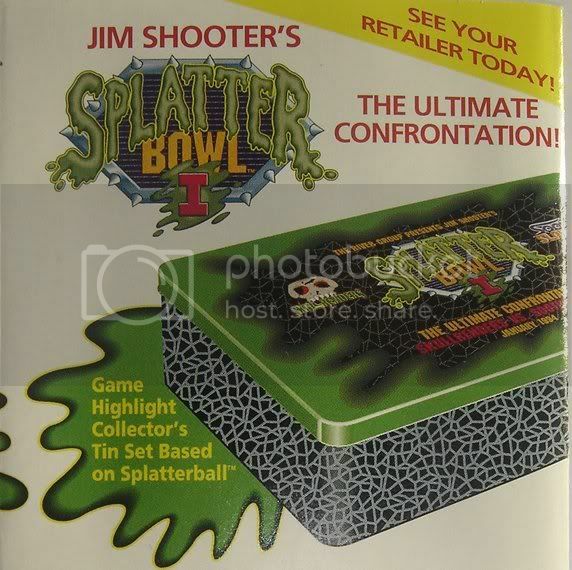 I have quite a few of the Splatterbowl tins but they all have the same art deco. Anyone ? Thoughts ? FACTS ? Was this person aware that there were two, but numbered I & II maybe? Ahhh, that was never produced. Things never lasted that long for Defiant. Impending law suits, ongoing lawsuits made it incredibly difficult to put out MANY of the different ideas for marketing the Defiant Universe. But I remember hearing this or reading this but Jim Shooter didn't have 100% coverage on what was going on with the 'non-sports trading cards'. 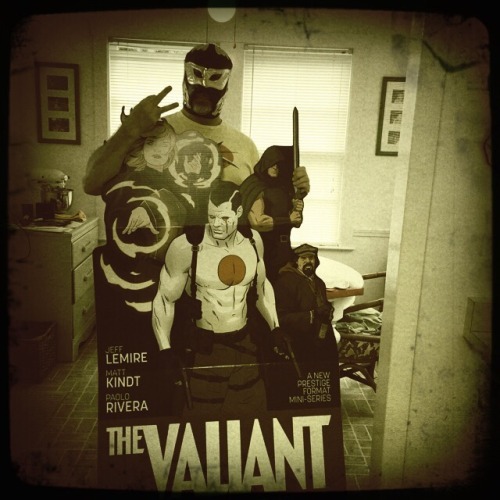 Many of those idea were handled by The River Group who capitalize on that niche in comics. Too bad that comic book cards would soon plummet leaving cards at a hardly collectible status. I remember seeing my Shooter signed card (pulled it from my first purchased box) go from $350 down to $40 in just 4 months. Now you can snag them for $5.00 and up to $20. My current quest is to get one of every level I chase card signed by Shooter. CorvetteJim has a near complete collection of these cards. When the cards were re-issued, the Shooter signed card was put in boxes of Dark Dominion and are considered second generation Shooter cards. You can tell this by looking at the cards... the Plasm signed cards have a coating over the signature (raw card signed by Shooter, then 'treated'), the Defiant cards were taken from the already large supply of chase cards from the Plasm set and Shooter signed those OVER the plastic treatment. Again, relying on memory here but I believe Jim was quoted as say that he 'didn't know how many cards he signed'. What makes me roll my eyes to this day is, when the Plasm set came out it was supposed to be the ONLY way to get the Zero issue... well that was a damned good idea. Until a short time later the Zero issue showed up in it's entirety in an issue of Previews, TOTALLY defacing the value of the card set, the only thing which kept the value from dropping through the floor was the First and Second edition binders AND the exclusive tin which had thicker cards, a foil treatment to the word 'Plasm' on the cards, five special cards, the last level card, and a cassette which was a reading of the Origin of the Defiant Universe, case limited to 5,555 units. I know that there is an MP3 version of the reading out there somewhere. Anybody have a copy they could share ? I am looking for Speakeasy's 'The Mercury Chronicles' if anyone can help. I got lots to trade! Ill check, but pretty sure i dont have any of these, however im sure you will have some nicer bits that i dont have, maybe we can do a deal in a few months.